Clean virtually anything using hydropower! Brush Hero Ultimate Detail Brush Starter Set, using the power of water, cleans virtually any surface that needs cleaning! After attaching to your garden hose, the Brush Hero Ultimate Detail Brush’s bristles are spun around creating a tornado of cleaning power! Clean your wheels, trims, doorjambs, grilles, motorcycle parts, boats, gutters, the list goes on and on! No crazy air compresses or pressure washers needed here – simply plug the Brush Hero Ultimate Detail Brush into your garden hose and get to washing! 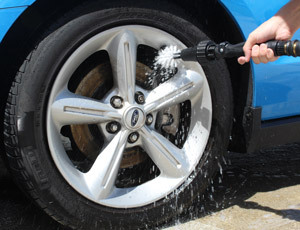 Quickly cleaning of wheels has never been easier! White Bristles: This brush is the stiffer of the two, and is perfect for removing heavy brake dust, stuck on bug remains, road grime, and even stubborn tar. Black Bristles: This brush is the softer of the two and made for delicate metal finishes, easily scratched plastic pieces, and convertible tops. Also included in the Brush Hero Ultimate Detail Brush Starter Set is the garden hose quick connect adapter. This allows you to easily hook and unhook your garden hose for rinsing during a detail. The lightweight body uses a handy on/off lever control valve that eliminates any water getting places you don’t want it to go. If you’ve ever spent hours on your hands and knees thoroughly detailing your wheels and undercarriage, the Brush Hero Ultimate Detail Brush Starter Set was made for you. Quickly and easily clean all lower surfaces – using only the power of water!